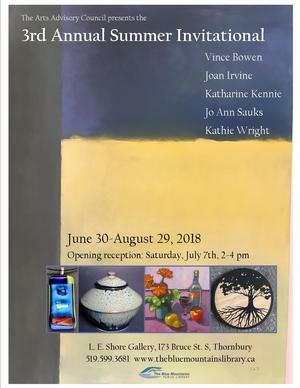 Join us July 7th, 2-4 pm, for the opening reception of our 3rd Annual Summer Invitational exhibit in the L.E. Shore Gallery. Meet the artists and enjoy refreshments while you peruse the many styles and techniques represented by local artists Vince Bowen, Joan Irvine, Katharine Kennie, Jo Ann Sauks and Kathie Wright. Show runs from June 30 till August 29th.